Just as emerging spring tulips unfurl and stretch toward the morning sun, so does our fury friend,, Peter Rabbit. 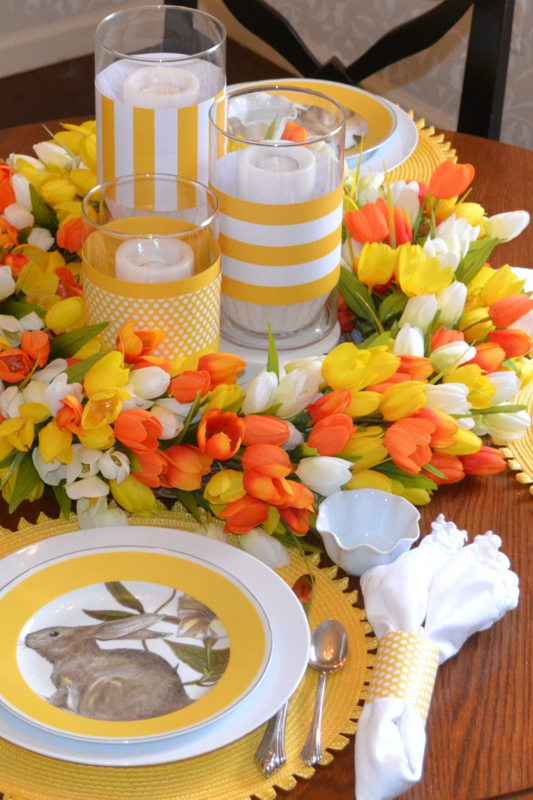 Forget the winter blues and hop into spring with a sunny yellow, orange, and white springtime table setting. 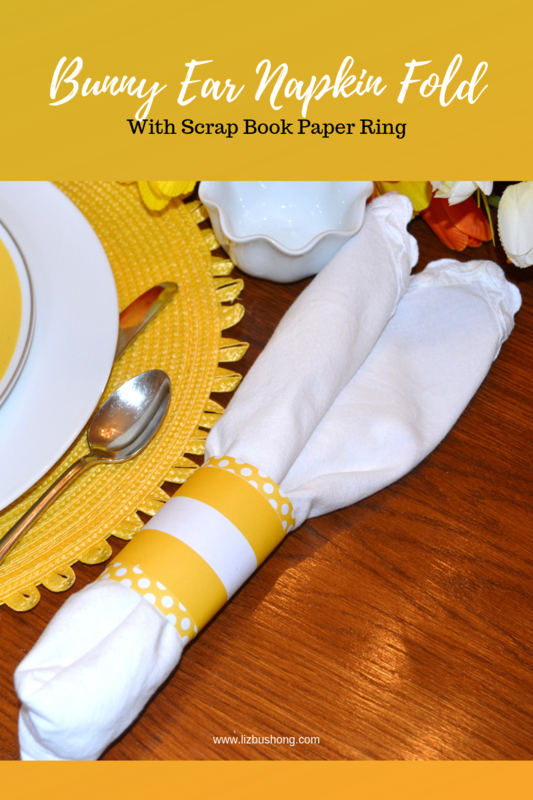 Dress your spring table with fun and colorful projects you can make in minutes. 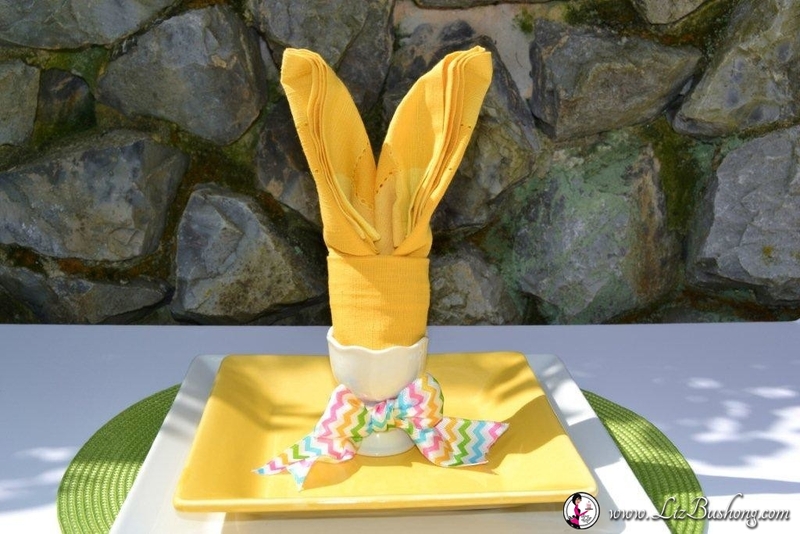 Floppy bunny-shaped ears are made from a white ruffled napkin that is folded neatly and banded with golden yellow wide stripe and polka dot scrapbooking paper. 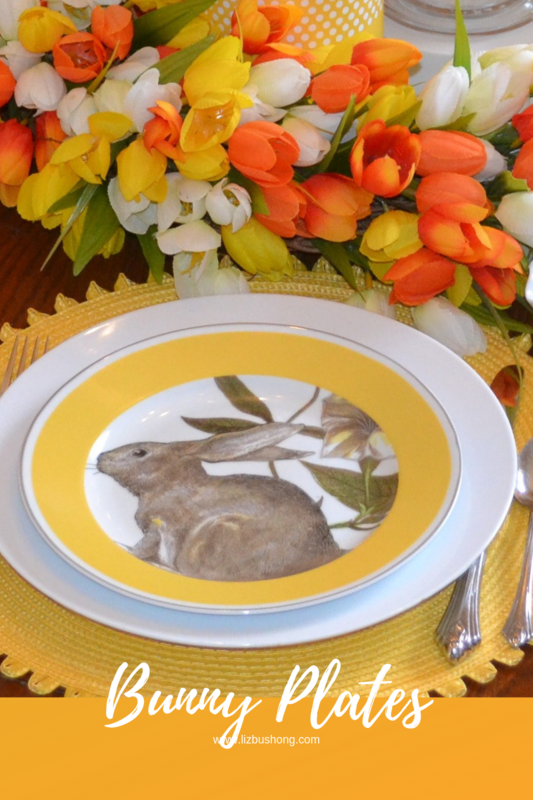 Golden round placements provide the foundation for the classic white dinner plate and playful bunny salad plates. Pulling double duty, the tulip centerpiece can be used on your dining table or as a door décor for your front porch. A large grapevine wreath hides the stems of petite orange, yellow and white faux tulips. The tulips are arranged in a circular motion to mimic the roundness of the wreath. 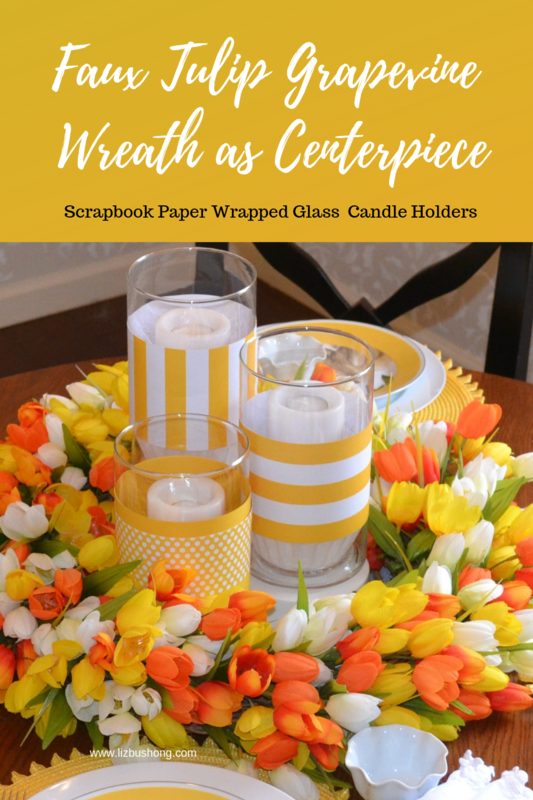 As a table centerpiece three round canisters are wrapped with alternating striped scrape booking papers to carry the golden yellow color scheme and placed in the center of the tulips. The glass canisters have a pleated coffee filter in the bottom of the container for added detail and continuity with the white and yellow theme. When the Easter dinner is over, you can use the tulip wreath for your main entry door décor. 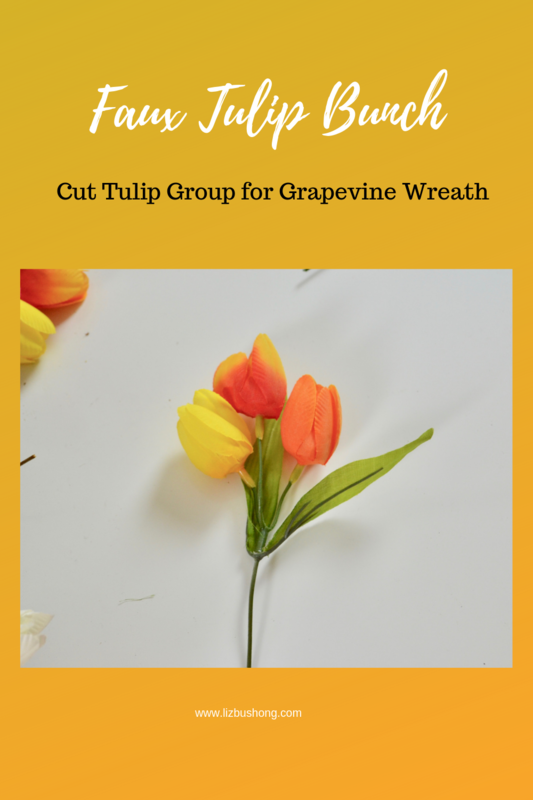 You will need 1-12″ grapevine wreath, 15 bunches yellow, white and orange faux tulips, wire cutters and green pipe cleaner to hang the wreath. Separate each flower bunch off the large stem. Insert the smaller flower groups into the wreath beginning along the outside edge. Continue filling wreath until desired fullness. For best results keep the flowers going in one direction. Easter is a wonderful season and comes early this year, so hop to it and do all the fun things you have planned to do with your family and friends. 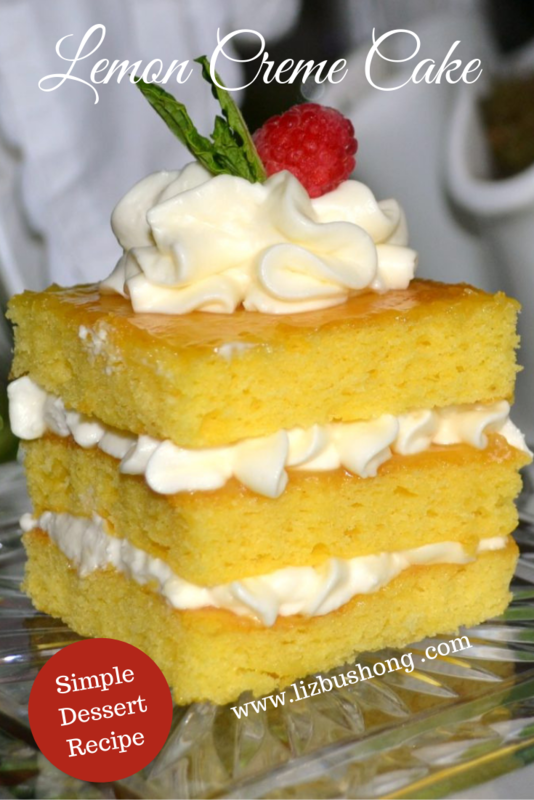 With these easy ideas and do- it -yourself projects your family will be amazed at your creativity. Whether you are hosting a luncheon, or an Easter dinner, this warm and sunny setting will brighten everyone’s day.